The Rigel 62353+ is the smallest and most flexible electrical safety analyzer on the market with battery powered earth/ground bond and insulation testing. 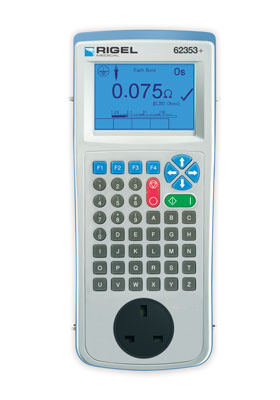 The Rigel 62353+ electrical safety analyzer offers an accurate and fast solution for testing in accordance with the IEC 62353 safety standard. Offering a range of tests without the need for mains power, the 62353+ is capable of conducting battery-powered insulation and earth/ground bond testing. This offers complete freedom to move around in often crowded rooms during the installation process, eliminating the inconvenience of trailing mains cables. The 62353+ has added two new insulation resistance tests (50V DC and 100V DC) to complement the 250V DC and 500V DC insulation tests that were present in its predecessor, the Rigel 62353. These new tests conform to growing manufacturer’s test requirements for increasingly popular equipment running on 24V DC and 48V DC, such as operating tables, lights and mobile X-rays. Combining automatic and manual test sequences, data storage and direct download facilities, the Rigel 62353+ remains the most compact electrical safety analyzer of its kind. Automatic warning of secondary earth/ground paths ensures users are made aware when invalid readings are made, thus ensuring correct and accurate test results first time, every time. Custom tests can be created using a variation or combination of the above. The Rigel 62353+ is available in a wide range of power configurations to suit local requirements, and conforms to several international standards including IEC / EN 62353, NFPA-99, AS / NZ 355199 and many other local variants. The comprehensive database software, Med-eBase, ensures fast and easy download of test results, straightforward management of asset databases, creation of test sequences and the ability to produce professional test certificates. Method 2 wire technique, using 'zero' lead function.